If you’ve ever had to lug around heavy photography equipment while traveling or hiking in the backcountry, you probably know that it can be a challenging task. But it is also a challenge to cut the weight of camera gear, as all of those bodies and lenses are usually necessary for capturing the perfect shot. That means if you want to shave ounces from the load that you carry, you’ll generally have to do it elsewhere. That is exactly the approach that MindShift Gear took when designing their new Ultralight line of backpacks, which just might be the lightest photo-centric packs available on the market today. These bags have all of the important features that photographers require to keep their fragile gear safe in the backcountry, without having to compromise their performance as an outdoor or travel pack in any way. The new line of backpacks includes three bags in total, the Ultralight Sprint 16L, the Ultralight Dual 25L, and the Ultralight Dual 36L. Each of the packs includes specially designed storage spaces built to hold a camera body and several lenses, as well as integrated tripod mounting systems, laptop/tablet sleeves, and extra cargo capacity for carrying personal items. They are also hydration ready, come equipped with built-in rain covers, and have extra organizational pockets for storing snacks, memory cards, extra batteries, charging cables, and so on. 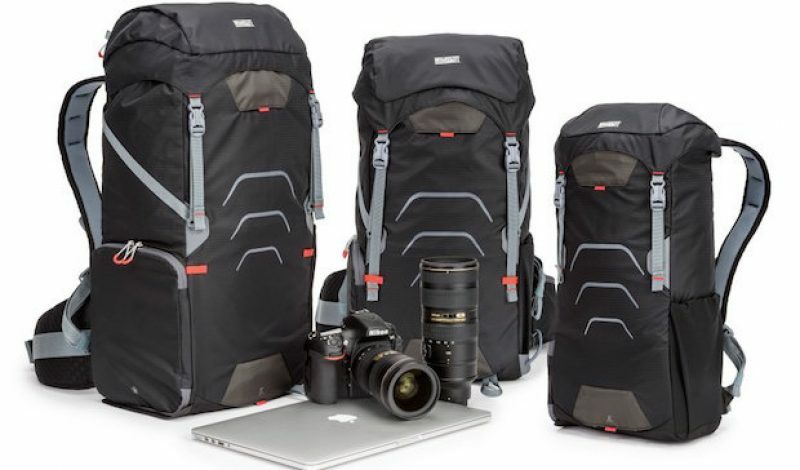 The two larger packs even have grab-and-go removable camera compartments that allow photographers to leave the pack behind, while traveling with just the photography gear they need. MindShift’s CEO Doug Murdoch says that when the company sat down to design its new pack collection it was with the intention of making them as svelte as possible. To that end, the company used lighter weight fabrics, thinner webbing, and less padding in the shoulder straps. They even incorporated lighter buckles and zippers in an effort to reduce the overall weight. It remains to be seen whether or not using lighter fabrics and buckles has an impact on the pack’s longterm durability and carrying capacity, but it definitely had the effect that Murdoch wanted. These bags are very light, with the Sprint 16L tipping the scales at just 1.9 pounds, while the Dual 25L and 36L weigh 2.8 and 3.3 pounds respectively. That may not seem all that impressive by backpacking standards, but it is definitely an improvement in the photography world. The prices for the three packs are fairly competitive as well. The Sprint 16L runs $120, while the Dual 25L will set you back $170. Unsurprisingly, the Dual 36L is the most expensive of the bunch, coming in at $200. Find out more about the Ultralight series of photography packs at MindShiftGear.com.